Everything you need to get your business started is right here! 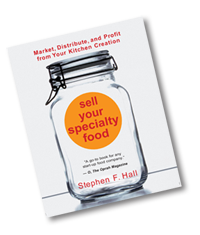 Kitchen to Market -Sell Your Specialty Food reference book , jam packed with detailed information. Expert business coaching tailored to your specific needs. Professional specialty food marketing workshops designed for the entrepreneur. Business resources with everything you require to be successful. Learn & Grow Forum with thousands of entrepreneurs just like you. Food Entrepreneur Magazine with latest food industry articles, tips and tools right to our inbox. Sign up right here! All great food starts with great recipes, but it takes more than a tasty product to have a successful specialty food business. You must plan, build a brand, engage consumers, and grow sales. You don’t want just customers, you want raving fans. Learn more about the tools and resources in our Recipe of Success in taking your vision from Kitchen to Market. Want to learn more? Get in touch with us. We’d love to help.